The term "red tide" refers to different types of algal blooms, which can be various hues depending on the species and the photosynthetic pigments they contain. Blooms occurring offshore can sometimes float toward the shore, as shown here off the southwestern coast of Molokai, Hawaii. Some blooms have the potential to be harmful to ocean life and humans. may turn sea water orange, yellow, brown, or purple. Red tides have been witnessed for centuries and have been seen all over the world. Dense concentrations of algae are referred to as blooms, because the algae have multiplied rapidly to become concentrated in high numbers. In a bloom, there could be tens of millions of cells in a liter of sea water. Most blooms are not harmful, but some have the potential to be harmful, whether by virtue of natural biotoxins (poisons) produced by certain species of algae, or by the oxygen-depleting process initiated upon the death and subsequent decay of large concentrations of algae. Harmful algal blooms, or HABs, cause millions of dollars in damage when there are massive fish kills to be cleaned up, beaches declared offlimits, fisheries and shellfisheries closed to harvesting, and medical treatment provided for people poisoned by marine biotoxins in the seafood they ate. Many scientists believe that harmful algal blooms are becoming more prevalent, but they point out that increased monitoring efforts are detecting more occurrences. How do certain microscopic algae—that is, types of phytoplankton —cause harm to fish, shellfish, marine mammals, seabirds, and people? Basically, there are four ways. First, the physical presence of so many cells may suffocate fish by clogging or irritating the gills. Second, when the densely concentrated algal cells die off, the decay process, assisted by bacteria, can deplete the water of oxygen, which in turn can lead to the death of oxygen-dependent marine creatures. (Algae, being plants, require nutrients such as nitrogen and phosphorus to grow. When they have used up the nutrients, they tend to die off all at once.) Such oxygen-related impacts are most visible in shallow bays, inlets, or seas. abalone, and fish. Airborne toxins (i.e., toxins that are aerosolized) have caused respiratory problems and eye and skin irritation to people along beaches where harmful algal blooms were present. Fourth, shellfish such as mussels, clams, and oysters feed by filtering particles, including phytoplankton, from sea water. Toxins from certain dinoflagellate or diatom species accumulate in the tissues of shellfish. When people, sea mammals, or seabirds eat the shellfish, they ingest the toxins as well. There are different kinds of toxins that cause different kinds of symptoms which, in humans, typically are neurological. Some toxins are deadly. The table above shows the categories of human poisoning; the organism associated with the toxicity; and the causative toxin (sometimes among a suite of toxins). The algal species that can be toxic in some circumstances are not always toxic. When they are toxic, they cause harm by being eaten by larger organisms. As a toxin is passed up the food chain , it becomes concentrated in larger and larger animals such as fish and shellfish, and eventually is ingested by people who eat seafood containing the toxin. In the following overview, only two examples of the various algal species known to cause toxicity are discussed. An exception to toxin transmission up the food chain is the dinoflagellate Pfiesteria. Instead of being eaten, it does the eating—usually small organisms but also fish. It uses its toxins to make the fish lethargic and to injure the fish's skin. Toxins can also get into the air and cause harm to people, as happened in 1991 when this peculiar organism was first discovered in a laboratory in North Carolina. Later it was found in connection with fish kills in the Albemarle–Pamlico estuary and other estuarine environments on the U.S. Atlantic and Gulf of Mexico coasts. Blooms of the more common dinoflagellate, Gymnodinium breve, when present in nearshore waters, can be picked up by surf and wind and carried to the seashore in the air. The microscopic organisms cause skin and eye irritation in people exposed to this toxic aerosol . A red-tide dinoflagellate typically has a vegetative stage, in which it multiplies by cell division, and a cyst stage, in which two cells combine to form gametes enclosed in a cyst (a type of covering). The cysts sink to the seafloor until conditions are favorable for a return to the vegetative stage. The Pfiesteria organism has a minimum of twenty-four stages in its life cycle, of which at least four are toxic. The life stages include flagellated cells that swim in the water, amoeboid forms both in the water and in bottom muds, and cysts that rest on the bottom. The different forms vary in size from too small to see with an ordinary microscope, to a speck visible to the naked eye. Most of the time, the Pfiesteria dinoflagellate is a nontoxic predator that feeds on small organisms such as algae, bacteria, and small animals. It becomes toxic when cyst forms detect fish excretions or secretions. Encysted cells emerge and become toxic. They damage the fish with the toxin, then feed on the epidermal tissue, blood, and other substances that leak from sores on the incapacitated fish. When the fish are dead, the cells change to the amoeboid stages and feed on the fish carcass. Diatoms are single-celled marine or fresh-water algae that have shell-like structures, called frustules, made of silica. Until recently, diatoms were not associated with biotoxin poisonings. But in 1987, an outbreak of domoic acid poisoning was reported in Canada. The domoic acid came from a diatom, Pseudo-nitzschia. Domoic acid has caused permanent memory loss and death in humans. In 1991, examination of the stomach contents of dead seabirds found along the beaches of Monterey Bay, California revealed high levels of domoic acid. The birds had been eating anchovies which had been consuming Pseudo-nitzschia. In 1998, sea lion deaths on the California coast also were associated with domoic acid, which entered the food chain via toxigenic diatoms, which were eaten by anchovies that in turn were eaten by the sea lions. To prevent human illness when such toxicity is found, state health departments temporarily close beaches and federal regulatory agencies temporarily close fisheries and shellfisheries along the affected coast. Although the economic impacts of HAB outbreaks has not been quantified on a national basis, the direct and indirect costs to even a single fishery closure can reach millions of dollars. In addition to loss of revenue to fish and shellfish industries, there are impacts on recreational fishing and tourism and their associated businesses. Harmful algal blooms also can threaten the aquaculture industry. For example, unpredictable and destructive blooms of the small flagellate Heterosigma have threatened the commercial farmed salmon industry in Washington state (USA) and British Columbia (Canada). Heterosigma blooms also have destroyed some captive populations of threatened and endangered salmon being raised in net pens before their release to the wild. All of the U.S. coastal states have developed monitoring programs with regular testing of fish and shellfish from beaches. Officials and volunteers watch the shores for patches of colored water, fish kills, the beaching of marine mammals and other unusual activity, or reports of human illness following consumption of fish or shellfish. When toxins show up in laboratory analyses of samples of edible species, warnings are issued and shellfish harvesting and some kinds of fishing may be halted. Economic losses can be high when commercial fishing and aquaculture operations (including fish and shellfish farms) are affected. To better manage the human risk associated with HABs, scientists are continuing to research methods of rapid analysis to identify toxic phytoplankton species and to detect marine biotoxins in water, phytoplankton, and animals. Better monitoring can help decrease the incidence of overly conservative fishery closures by delineating the extent of the threat, thus reducing the need for broad-scale closures due to lack of information. 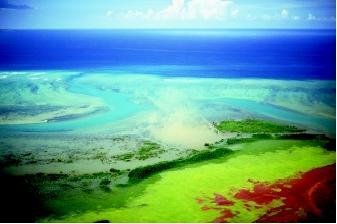 The Harmful Algal Bloom and Hypoxia Research and Control Act was enacted in 1998. The act recognizes that HABs threaten coastal ecosystems and endanger human health. A national assessment, published in early 2001, recognized the threat to human health and coastal economies, but found that management options are limited. HAB impacts can be minimized through monitoring programs that regularly sample shellfish to detect HAB toxins, and issue warnings when toxins are found. Satellite remote sensing can track offshore blooms, alerting coastal communities to potential problems as blooms come inshore. SEE ALSO Algal Blooms in the Ocean ; Bivalves ; Coastal Ocean ; Crustaceans ; Ecology, Marine ; Fisheries, Marine ; Food from the Sea ; Human Health and the Ocean ; Marine Mammals ; Oceanography, Biological ; Plankton . Falconer, I. R., ed. Algal Toxins in Seafood and Drinking Water. London, U.K.: Academic Press, 1993. Woods Hole Oceanographic Institution. ECOHAB, The Ecology and Oceanography of Harmful Algal Blooms: A National Research Agenda. Woods Hole, MA: WHOI, 1995. Yasumoto, T., Y. Oshima, and Y. Fukuyo, eds. Harmful and Toxic Algal Blooms. Paris, France: Intergovernmental Oceanographic Commission of UNESCO, 1996. Anderson, Donald M. The Harmful Algae Page. Woods Hole Oceanographic Institution, National Office for Marine Biotoxins and Harmful Algal Blooms. <http://www.whoi.edu/redtide> . 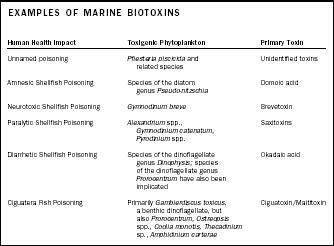 Marine Biotoxins and Harmful Algal Blooms. Northwest Fisheries Science Center, National Oceanic and Atmospheric Administration. <http://www.nwfsc.noaa.gov/hab> . Pfiesteria piscicida and Pfisteria-like Organisms. The University of Maryland. <http://www.mdsg.umd.edu/pfiesteria> . The IOC Harmful Algal Bloom Programme. The Intergovernmental OceanographicCommission of UNESCO. <http://ioc.unesco.org/hab> . Toxic and Harmful Algal Blooms. Bigelow Laboratory for Ocean Sciences. <http://www.bigelow.org/hab> .